Jim Carrey is back in the news, battling it out with the NRA with a series of paintings. A 2013 video spoof, “Cold Dead Hands,” is making the rounds again as the “March for Our Lives” movement takes America by storm. Jim Carrey has been busy this month, taking on the NRA, the gun lobby, and do-nothing politicians with a series of paintings posted on his Twitter account. The round of activity comes as the “March for Our Lives” movement continues to gain international momentum in the wake of the February 14 mass shooting at Marjory Stoneman Douglas High School in Parkland, Florida, that tragically took the lives of seventeen people, wounding an additional seventeen. However, Carrey’s battle with the NRA first took off on March 25, 2013, when he released a music video with “Funny or Die” mocking America’s gun culture. 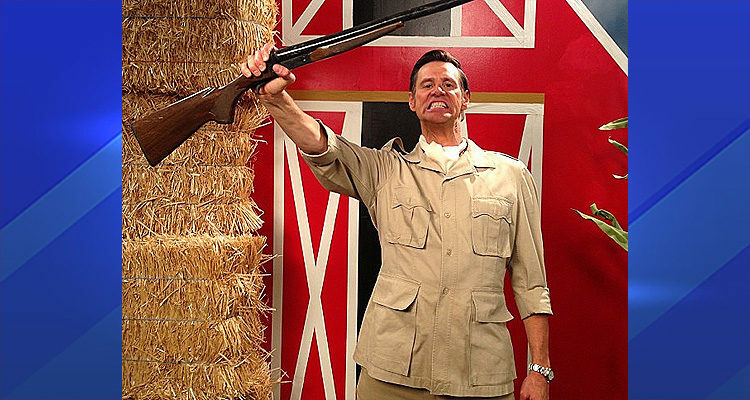 The song and video, titled “Cold Dead Hands,” spoofed the vintage television show “Hee Haw” with Carrey taking on the role of Charlton Heston, who interacts with the show’s host. The title is a reference to a now infamous statement by Heston made while he was acting as spokesperson for the NRA – the National Rifle Association. For the next six months Al Gore is going to smear you as the enemy. He will slander you as gun-toting, knuckle-dragging, bloodthirsty maniacs who stand in the way of a safer America. Will you remain silent? I will not remain silent. If we are going to stop this, then it is vital to every law-abiding gun owner in America to register to vote and show up at the polls on Election Day. The song ridicules American gun culture, and specifically the deceased Heston, including a derisive caricature of him and declaring that he could not enter Heaven, as even the angels could not pry the gun from his hands. Staged as an episode of the variety program Hee Haw in which Heston is a guest star, the video also features The Eels dressed as Abraham Lincoln, Mahatma Gandhi, and John Lennon (all notable advocates of nonviolence who were assassinated). The single marks the Eels’ first release since their album Wonderful, Glorious earlier in 2013.